This talk is based on joint work with Jingshu Wang, Nancy Zhang, Dylan Small (University of Pennsylvania); Jack Bowden, Gibran Hemani, George Davey Smith (University of Bristol); Yang Chen (University of Michigan). 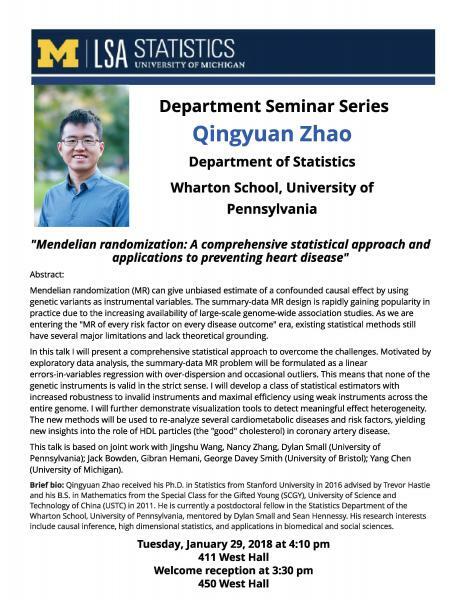 Brief bio: Qingyuan Zhao received his Ph.D. in Statistics from Stanford University in 2016 advised by Trevor Hastie and his B.S. in Mathematics from the Special Class for the Gifted Young (SCGY), University of Science and Technology of China (USTC) in 2011. He is currently a postdoctoral fellow in the Statistics Department of the Wharton School, University of Pennsylvania, mentored by Dylan Small and Sean Hennessy. His research interests include causal inference, high dimensional statistics, and applications in biomedical and social sciences.